Talking to paper is talking to the divine. Paper is infinitely patient. Each time you scratch on it, you trace part of yourself, and thus part of the world, and thus part of the grammar of the universe. 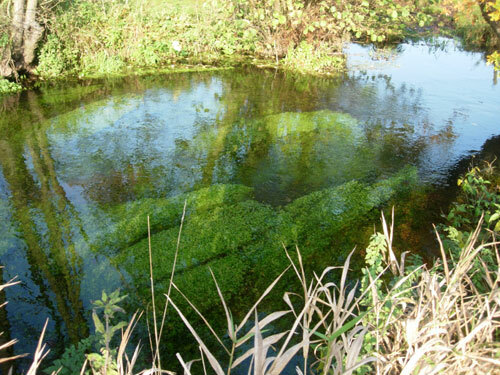 River Bure with long green hair. I wanted a make a natural book and perhaps one obvious thing would be to make handmade paper and bind it with nettle cord. One day. 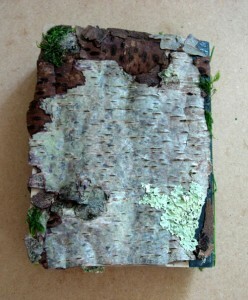 Instead I decided to collect natural materials – as I do for some of my paintings – and simply decorate one of my journals. 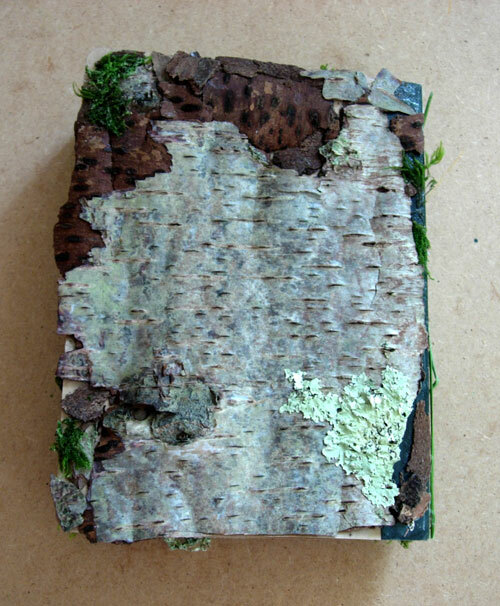 I took one of my small, kraft paper notebooks and covered it first with bark – I think it is hazel bark – then moss and finally lichen. The spine I have decorated with rushes. 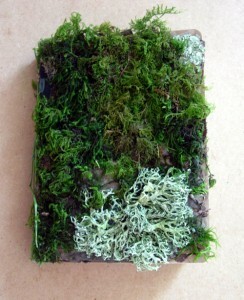 A very earthy journal! The trouble is that bits fall off while I’m writing out my dreams first thing in bed! Journalling or writing a diary is very important to me; I write most days but much of it is babbling thoughts that need sorting. 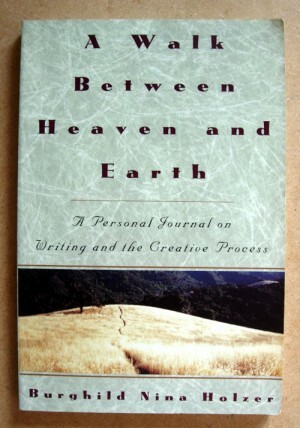 I have written a journal/diary since the age of 13 when I read Anne Frank’s diary; it moved me a great deal. 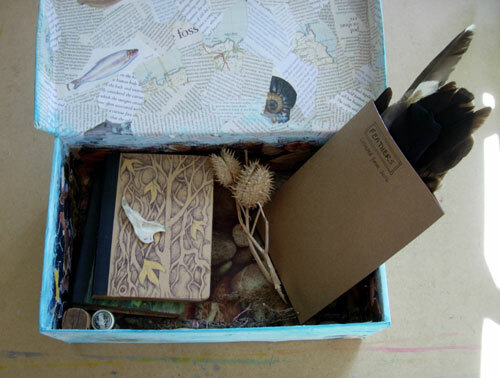 Now I have piles of old notebooks in storage boxes and I’ve decided to embark on a proper storage project: creating Diary Boxes that will contain all my journal/diaries as well as other memorabilia. 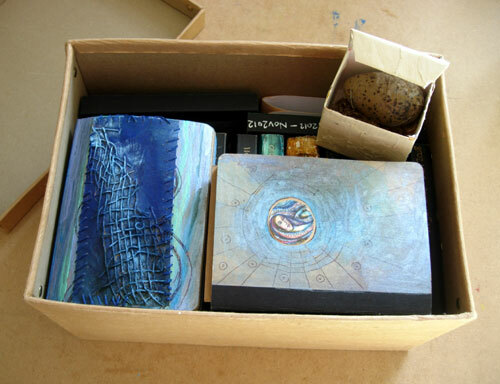 In these ones I have feathers, eggshells, rabbit jaw bones, letters and, of course, diaries. It is still possible to plunge into nature’s secret life. In some places, earth emits a dense breath, which, when inhaled by man, immediately passes on to him knowledge and sensations he possessed in former times, when living in its bosom. The telluric sensibility of ancient man can still be retrieved. Our capacity to fathom the ancient to discover the new. Nature presents itself as a transcendent experience, a means of reclaiming man’s hidden greatness, so that he may grow spiritually and penetrate the dark. 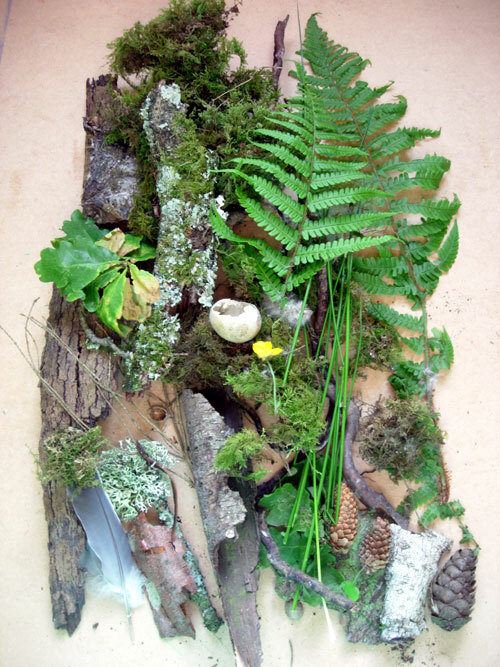 The forest is one of these privileged places, where it is possible to feel mother earth’s throb. It is where the sky takes roots in earth, a sacred space heavy with mystery. 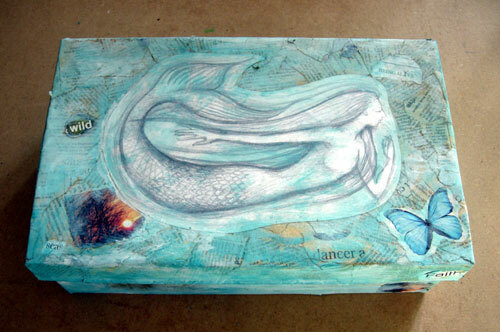 I have also discovered an artist Jan Kilpatrick, who creates all sorts of boxes. They look great! I have decided to leave my diaries to The Great Diary Project when I die – not that anyone would find them very interesting, but who knows?